Got Safety? The Red Cross does for you now in the form of an app for Android and iOS devices. The American Red Cross today launched its official first aid app, putting free and simple lifesaving information right in the hands of smart phone users. This app is the first in a series to be created by the American Red Cross, the nation’s leader in first aid and emergency preparedness information. It’s also the only first aid app created or endorsed by the American Red Cross for use on both the Android and iPhone platforms. It gives instant access to information on how to handle the most common first aid situations, and includes videos and interactive quizzes. Users who take quizzes can earn badges they can share with friends through social media to show off their lifesaving knowledge. The app takes critical first aid information normally stored on bookshelves and in pamphlets and places it at the fingertips of tens of millions of individuals – which will save lives. The Red Cross app includes trusted Red Cross disaster preparedness information for a number of common situations. The app is free and available for iPhone and Android users. Find the app in the Apple App Store and the Google Play Store for Android by searching for American Red Cross. The new app builds on the American Red Cross legacy of teaching first aid and lifesaving skills to people across the country. An average of more than 9 million people a year receive Red Cross training in first aid, water safety and other skills that help save lives. Downloading the app is not a substitute for training. 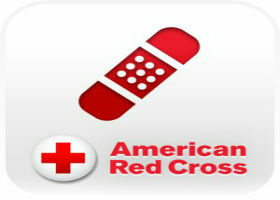 To learn more about American Red Cross first aid or register for a course, visit redcross.org/takeaclass.